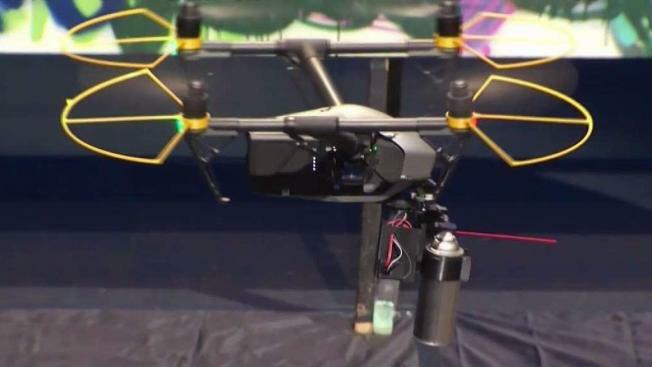 A pair of South Bay inventors Wednesday unveiled a drone they designed to cover up graffiti during a San Jose tech conference at the Hammer Theater. The device, invented by Candace Marbury and Christopher Farmer, is designed and equipped to spray paint hard to reach spots such as overpasses, which otherwise would require traffic disruptions to get painted. San Jose Mayor Sam Liccardo attended the convention, and he, like Caltrans, is anxious for the inventors to develop a larger version with the capability to climb and crawl. Marbury and Farmer say it will be a few months before they become a full-fledged company. But they are glad to have created something that can help better their community.